The Ohio EPA sued Gem Coatings and owner Karry Gemmell in Athens County Common Please Court last year. The local company had violated hazardous waste regulations, that could have been avoided. Spokeswoman for the environmental enforcement section of the Ohio Attorney General’s office, Kate Hanson, stated that the settlement called for a payment of $30,000 from Gem Coatings and the hiring of a contractor to draft a cleanup plan that will be filed in the case. The EPA stated that Gem Coatings improperly stored paint materials and paint waste, which, by the EPA, are considered hazardous wastes. The EPA also stated that the company dumped waste from sandblasting at the facility, illegally. Paint Storage can pose a serious threat to the environment and human health. Paints are considered, by the EPA, hazardous waste and/or flammable storage. If stored improperly flammable storage can catch on fire and/or explode, depending on the situation. 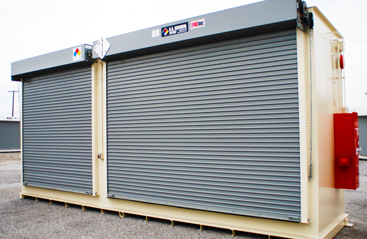 Making sure flammable storage is compliantly stored can decrease the risk of costly fines or hazardous situations. Flammable paint storage must be maintained regularly with the proper safety precautions. Flammable Storage or flammable paint storage containers are a perfect way to keep your paints stored properly and compliantly. These storage containers keep individuals safe as well as the environment. Make sure your paints are stored properly with a flammable storage unit from US Chemical Storage.